On the last day of January, in the late afternoon, I was checking the camera traps in the Moravian-Silesian Beskydy Mountains. As I was approaching the last site I planned to visit that day, I noticed a fresh lynx trail. I set to follow the tracks which were leading over the ridge, then started to drop quickly through a spruce thicket into a deep valley. I decided to return to the camera trap and finish my task changing the batteries before I would continue along the lynx tracks. Servicing the camera trap took me well over half an hour as I had to change its position and I tinkered for a while to find the right angle which would cover the entire area in front of the device. While I busied myself with this, I heard the sound of snow falling from one of the young beech trees standing about ten meters away. I did not pay much attention to this interruption and simply attributed it to the law of gravity or possibly a passing fox. Once the camera was all set, I returned to the ridge to follow the trail I had found earlier. The night fell but the sky was clear and dotted with stars. I did not switch on my headlamp and instead enjoyed the magic of the winter night in the mountains. I followed the lynx tracks down the slope to the valley. However, I soon found my progress blocked by an almost impenetrable growth of young beech and spruce trees. I backtracked to the ridge with the plan to follow the tracks in the opposite direction. What a surprise awaited me there! A set of fresh lynx tracks in my own footsteps, not ten minutes old. Finding myself in this vast mountain range in the presence of such majestic animal on a beautiful starry night, my mind suddenly whirled with emotions I did not even know a human could experience. It took me a while before I was able to think clearly again; then I decided to walk in the direction from which the fresh tracks were coming. The last thing I wanted was to disturb the lynx. I discovered that the lynx joined my trail just above the camera trap I had been adjusting moments ago. I could tell that his pace was very slow at times. Possibly, he could see me in front of him and slowed down not to "step on my heels". After giving the lynx some head start, I decided to walk for a little bit in his direction. I was wondering if his behaviour or speed changed in any way once he heard me climbing up the ridge. I was resolved to only follow the lynx for about 200 meters. Apart from intensive marking, the lynx just kept walking at a steady pace and straight direction. I saw several more lynx tracks of different age intersecting the fresh trail I was following. This made me think that he might have a prey somewhere nearby. Immediately, I turned around to leave and spare the lynx any unnecessary stress. Suddenly, I saw a pair of eyes reflecting the light of my headlamp, shining from behind the fallen tree barely twenty meters behind me. It was only a glimpse, the fraction of a second. I never found out for sure whether the eyes were really those of a lynx. I was leaving with mixed feelings; the idea that I might have disturbed the lynx at his prey worried me. The next morning I returned to where I saw the glowing eyes. The mystery remained unsolved, though, as I found several prints at that precise spot, some belonging to a lynx and some being those of a fox. There was also no sign of prey so at least I could stop worrying about disturbing the lynx during a meal last night. The trail climbed up the ridge in a completely natural straightforward motion suggesting that the animal was likely not suffering from any extreme stress. About 300 meters from the point where I turned back the previous night, I indeed found a freshly killed deer. I quickly set two camera traps in the hope that I might find out who was my silent companion last night. A week later, I went to change the batteries and replace the memory card in the camera trap installed by the kill. I was dying with curiosity and could not wait to get home and look at the photos. First I made another discovery, though. I tried to follow some of the older tracks leading by the prey. They took me along the similar route I walked on that memorable January night, only in the opposite direction. However, the snow conditions were not ideal for tracking and so I soon lost the trail. I passed through the beech stand where I heard the falling snow the other night. To my surprise, I found old lynx tracks there. I am convinced that the lynx walked pass me, possibly even watched me while I was busy setting the camera trap, not knowing in my wildest dreams that the largest European feline is sneaking by just meters away. The only clues that allowed me to piece most of the jigsaw together were various animal tracks of different age. Once at home, looking at the photos from camera traps, I was finally able to identify the main protagonist of the whole story. The unique pattern of markings on the animal's coat told me it was the lynx known to us as Bronislav. If I indeed looked into the eyes of a lynx for the first time in my life, it must have been him. Now I also knew which lynx has recently got into the habit of following my footsteps in the mountains! P.S. 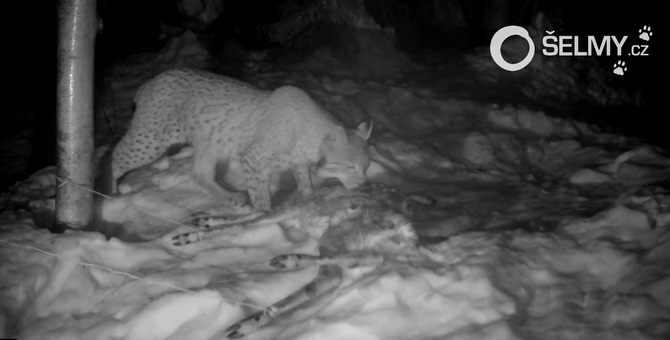 Subsequent checks of the camera traps yielded photos of not one but two lynx! Comparing their markings against the database, I determined that one of them was Bronislav and the other animal was a young female born in 2016 to an experienced lynx mother Draža. This means that Bronislav has found himself a "girlfriend" and together they have a chance to strengthen the lynx population of the Moravian-Silesian Beskydy. Wish them luck!